Before I tested this recipe I hadn''t eaten skate for a while. I''d forgotten just how brilliant a fish it is, with its long, tender strings of flesh, the touch of stickiness, the richness. It doesn''t need much embellishment; a shot of acidity sets it off beautifully. Mix the ginger, sugar, juice of ½ lime and ½ tsp sunflower oil in a small pan and add enough water to cover. Place over a medium heat and simmer until the liquid has all evaporated. Carry on cooking, stirring the strips of ginger until they are richly browned. Tip out onto a plate and separate the shreds as best you can. Reserve. Meanwhile, brush the skate lightly on both sides with a little more sunflower oil and place in a baking dish (if you''re using two larger skate wings, halve them first). Pour over the remaining lime juice and season to taste with salt and pepper. Slide into the oven and roast for 15 minutes or until the fish is cooked. 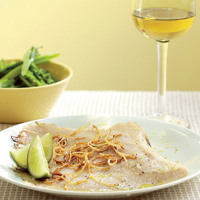 The simplest option now is to scatter the ginger over the skate in its dish and drizzle over the avocado oil. For a more stylish presentation, transfer the skate to individual warmed plates, then top with the ginger and drizzle avocado oil over and around the fish, before finishing with a lime wedge on each plate. Either way, rush to the table while still good and hot. The tang of the lime and ginger need a neutral, crisp white with plenty of verve.